Erica’s ATA pedicure burrs are designed with the nail tech in mind, requiring less aggressive joint movement while removing thick callused skin. Using pedicure bits with an e-file works best either as an upgraded service or as part of a waterless pedicure and leaves clients with satin-smooth feet, according to the company. All e-filing should be done before soaking. 1. Spray the client’s feet with antiseptic. 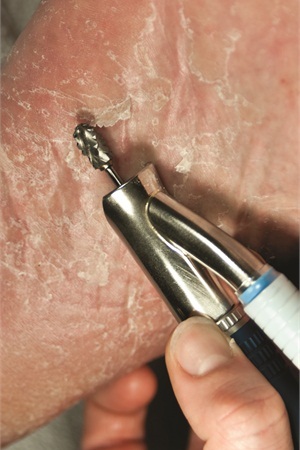 Attach a vacuum nozzle to the electric file and switch it on to eliminate airborne skin cells. 2. Use Erica’s rounded carbide pedicure burr to remove the larger flakes of dead skin. With a light touch, move the tool up and down over cracked skin. 3. Select one of the four grit sizes available for the diamond pedicure burr depending on the client’s skin type and callus thickness. (Pictured above is the Extra Course burr.) With a light touch, work the bit in a circular motion, running +9,000 RPMs. Start in one spot — preferably on the outside — and work your way in. Working in smaller areas and starting in the same location helps reduce the chances of missing patches or removing too much in one area. Use your free hand to feel how much callus has been removed. Continue rotating the burr in a circular motion until the skin is pink or smooth. 4. Cut and shape toenails with a Lady Diamond File Course grit. The all-natural diamond file is designed to take down thick and long toenails and can be disinfected after every client. 5. Use a diamond sphere burr, which is very forgiving around live tissue, to remove dead skin around the nail groove. When working around the cuticle with an e-file, your RPMs should always be low. The sphere burr can also be used to help round off pincher nails. 6. Apply lotion or oil to the client’s feet. The new skin will absorb product quickly; keep applying.